You'll be £16.99 closer to your next £10.00 credit when you purchase U-Boat Ace. What's this? Wolfgang Luth was one of only seven men to win Germany’s highest combat decoration. He operated in almost every theatre of the undersea war from Norway to the Indian Ocean and he was the second most successful German U-boat ace in World War II. Luth is credited with sinking 47 Allied ships and a submarine – a record topped only by Otto Kretschmer. In 1944, after 16 war patrols, including one that lasted a record 203 days at sea, he was named commandant of the German naval academy and, aged 30, became the youngest commandant of the German Naval Academy. Until the publication of this comprehensive study his accomplishments were overshadowed by other aces. To correct the neglect, Jordan Vause provides an entertaining, authoritative biography. Vause was intrigued after seeing a portrait of Luth as a midshipman on display and set out to learn all he could, tracking down some of Luth’s crewmen and fellow U-boat commanders. He draws on their first-hand information and a variety of written documents to provide a fascinating character analysis. In doing so, he encapsulates the paradoxes inherent in so many German submarine commanders, men spawned by the Nazi regime yet not entirely of it. 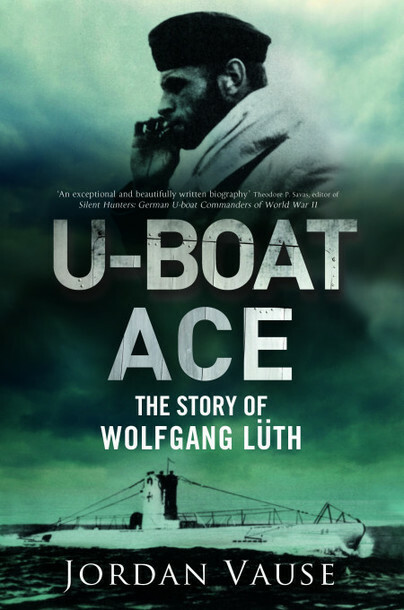 Vause portrays Luth as a man of contradictions: an agent Nazi ideologue who could bend the rules for a slack sailor, a U-boat ace who could treat survivors of his attacks with clemency but then impetuously gun down other victims in cold blood. Even his best friend admitted that Luth had no remorse for the misery he inflicted on the crews of sunken ships. On the night of May 13th 1945 he was accidentally shot and killed by a German sentry. On May 16th 1945 he was given the Third Reich’s last state funeral. Wolfgang Luth was an exceptional submarine commander, second highest scoring U-Boat Ace of WWII. Luth operated in almost every theatre of the naval war and was one of only seven German military personnel to be awarded the Knight’s Cross with Oak Leaves, Swords, and Diamonds – Most Highly Recommended. Jordan Vause is a 1978 graduate of the US Naval Academy. Now retired, he worked for a defence contractor in California.